Party post being shared by one of the new shop girls, Faith! 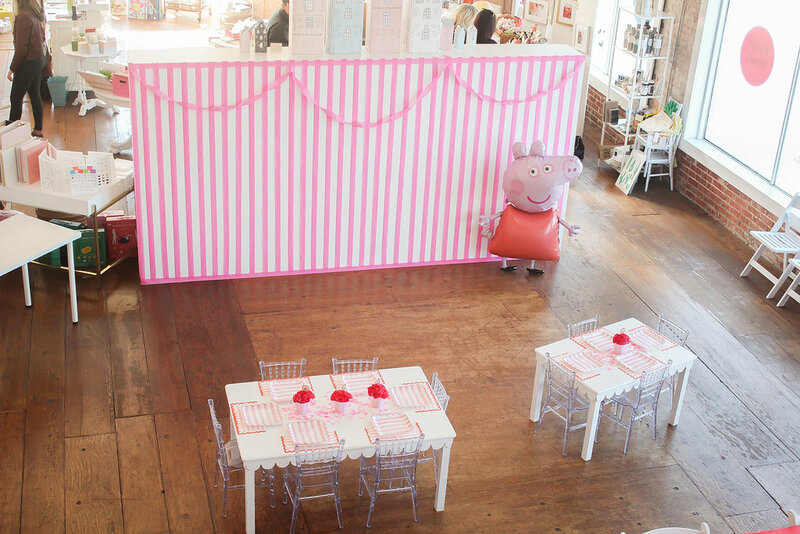 Recently, we hosted a Peppa Pig party for a two-year old at the shop! It was a festive celebration that was all things pink and red, and we had such a fun time planning it. 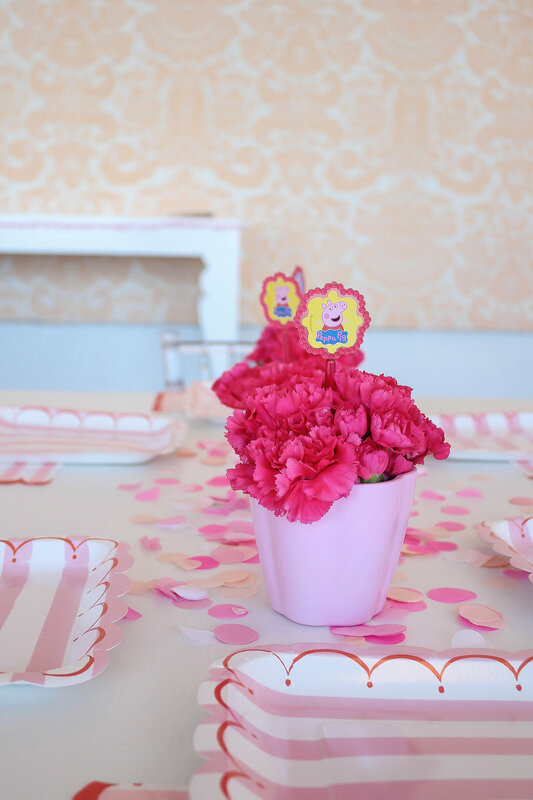 We wanted to create a look that was definitely inspired by Peppa, but also had lots of sweet touches scattered throughout the party space. 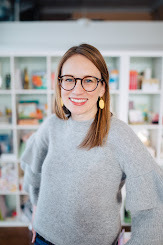 For the party’s photobooth backdrop, we created a striped look by taping bright pink streamers to our wall (with about two inches of white space between each one). Once all of the stripes were up, we framed the look by lining streamers on the top and bottom of the wall. To finish, we twisted the streamers into a garland look, putting two small garlands on the side and a larger, looser garland in the middle. To complete the Peppa Pig look, we brought in a giant Peppa balloon! The kids were so happy to see Peppa in real life! They got to take pictures with her, hug her and even hold her hand. It was beyond adorable. 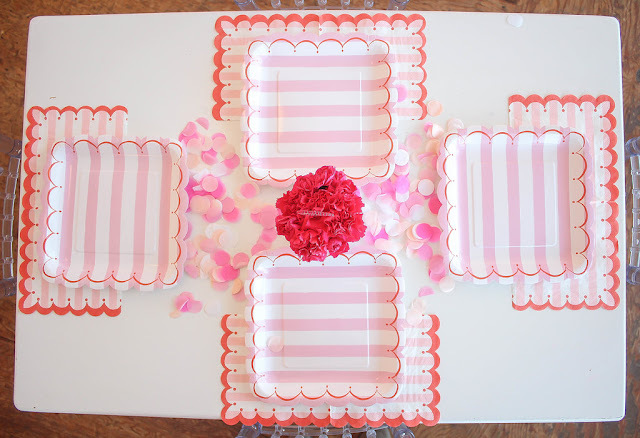 On the kid’s tables, we used large pink, striped plates and placed them on matching napkins. Peppa is a pink pig who always wears a red dress, so we wanted to showcase these colors throughout the entire party. 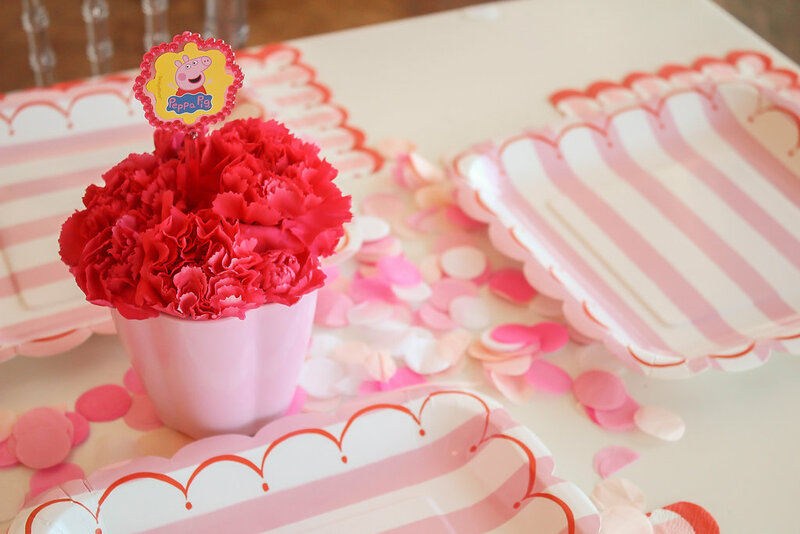 Since these Toot Sweet napkins and plates had both pink and red on them, we knew they would be perfect for our birthday girl! Once the napkins and plates were on the table, we sprinkled some paper confetti over the middle of the table and topped it all off with some pretty hot pink carnations! We were able to source some Peppa Pig wands, so these went in the middle of the flowers so that each table had some Peppa flair! 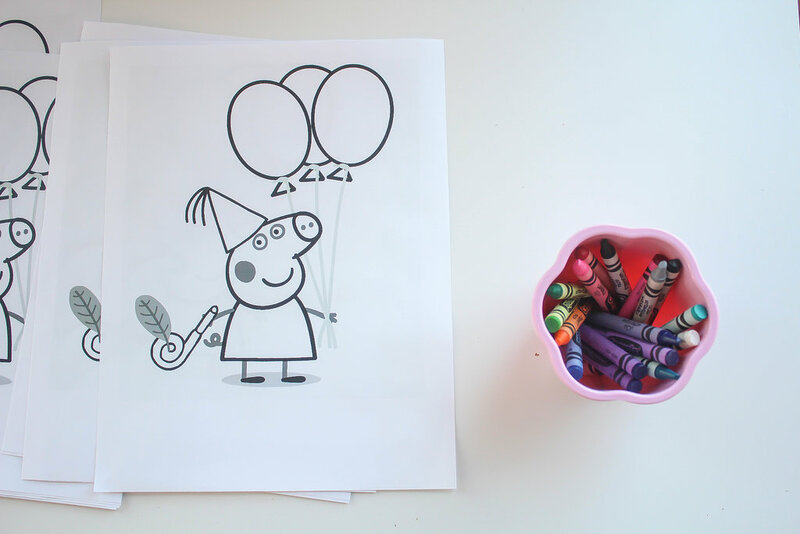 Before the kids arrived, we printed out Peppa Pig coloring pages and set crayons out. 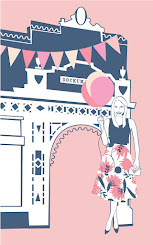 Having coloring pages is a great way for kids to stay entertained while waiting for their friends to arrive! 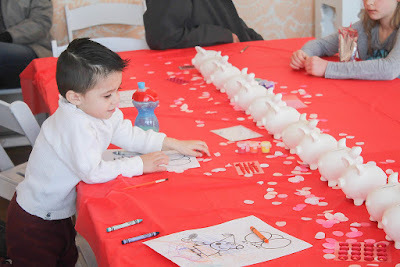 As each child walked in, we were able to send them to the table to see their friends, color a little and get ready for the party to get kicked off! It keeps them from getting impatient, and, perhaps more importantly, keeps them distracted for a while if you need a little extra time to set up or socialize! 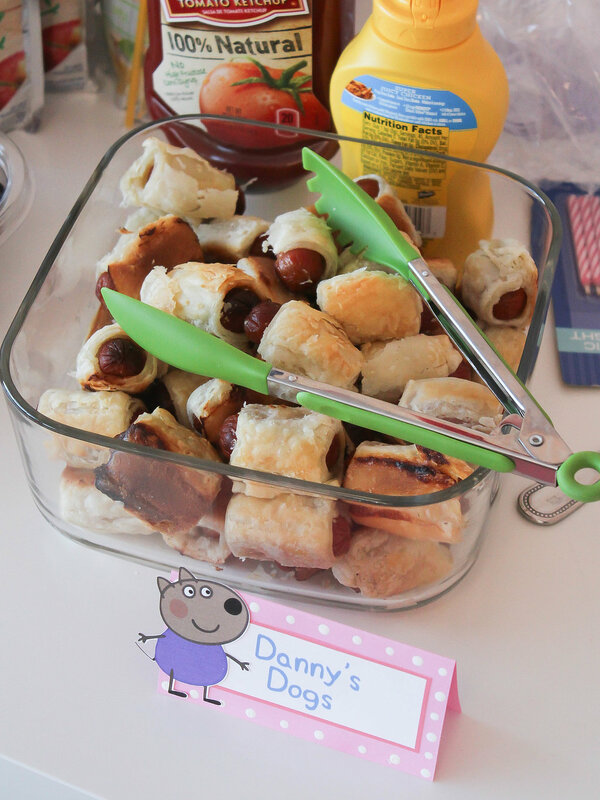 After everyone was there, it was time for lunch! 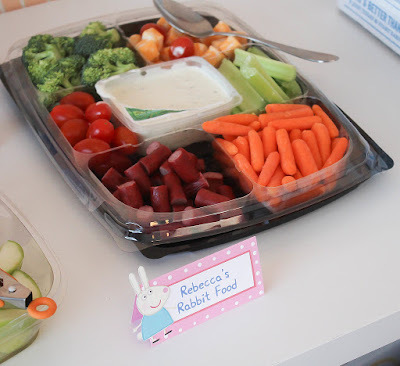 The party girl’s mom had brought in some great party foods, and even printed out labels for each food. All the snacks coordinated with a character in Peppa’s show and they even were written with alliterations. Maybe I’m just a sucker for alliterations, but it definitely made the lunch more special and added a nice touch! 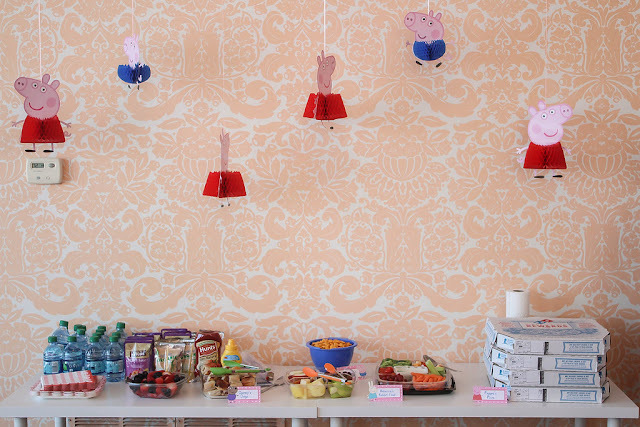 We used some hanging Peppa decorations to make the food table more of a focal point and add some flair. For the party activity, they wanted each child to decorate a personal piggy bank! We went ahead and ordered the banks, then decided to let the kids paint or use stickers to decorate. 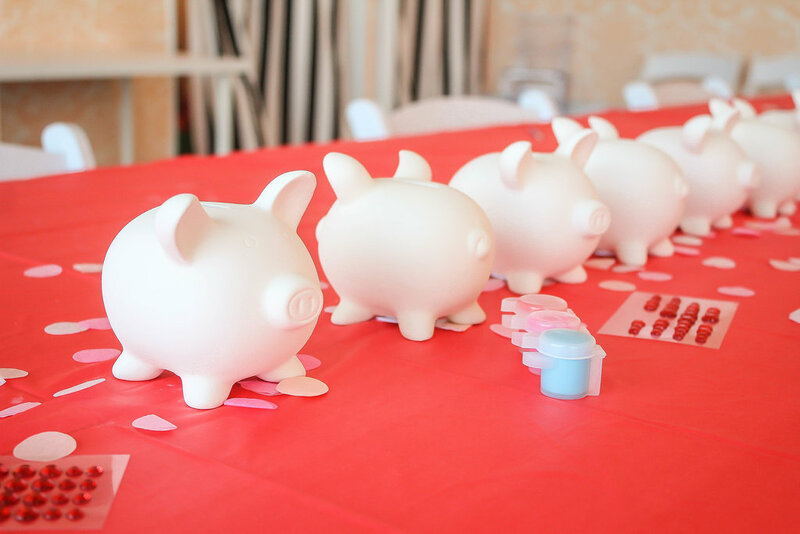 We brought in some pink and red jewel stickers for the smaller kids and let the older kids use some washable paints. 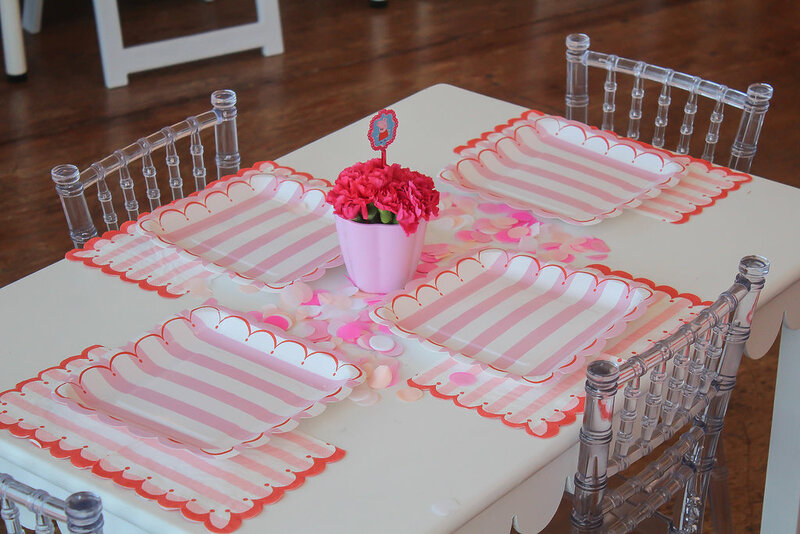 For the table, we used a bright red, disposable tablecloth. 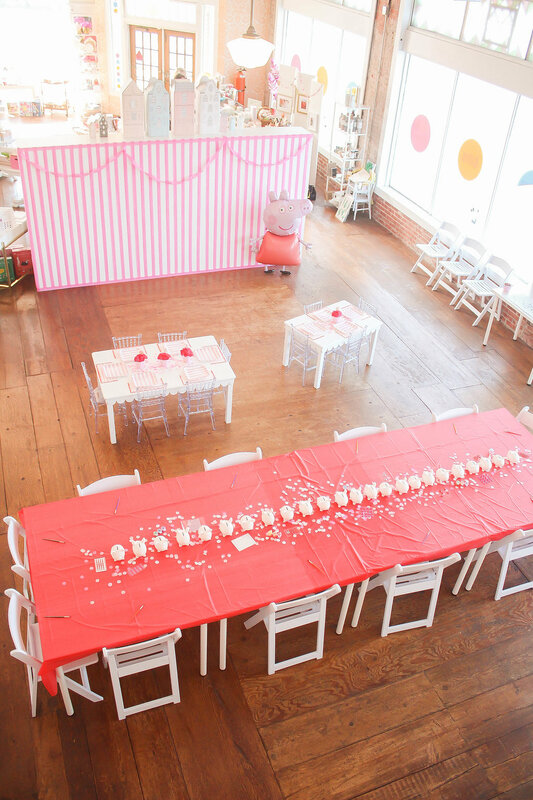 We sprinkled more of the pink, paper confetti down the middle of the table, then set the piggy banks on top. Each child had a paint brush at their place, so they had the option of painting or just using jewels. What is a party without some cake? For this birthday, we went through September Moon Cupcakery to order cupcakes in the shape of Peppa! 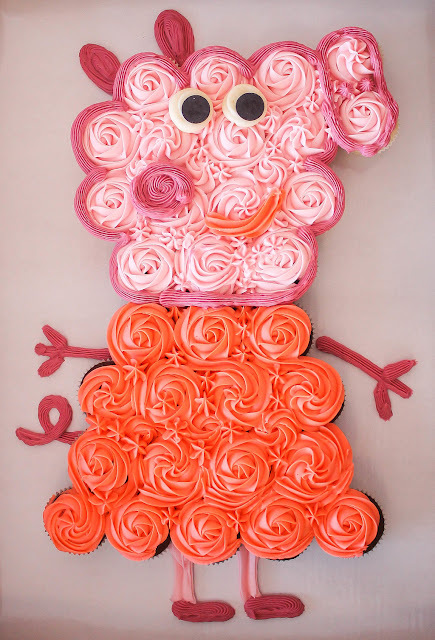 Cara did a great job of making the cupcakes look just like her! The colors of icing were spot on, and added a great touch to the party. I loved seeing the finished product in all its pink and red glory! Thank you to Nela for hosting at the shop, and thank you to everyone who came out to celebrate!